Envirotek Pte. Ltd., a Singapore-based investment company focused on clean technology, has announced its intention to develop commercial tidal instream projects in Southeast Asia. The initial focus is on the Philippines. 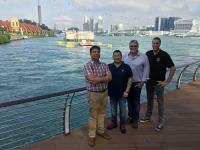 In mid-February 2017, Envirotek, working with an international team of experts, successfully deployed a 62 kW SCHOTTEL Instream Turbine (SIT) in the waters off the Sentosa Boardwalk in Singapore. This demonstration project showcases the viability of tidal energy in the region. “This project is about developing appropriate technologies to address the very real energy needs of Southeast Asia. We are committed to delivering these tidal energy projects within the region, which can make a real difference to the lives of so many”, says Jefferson Cheng, Chairman and Founder of Envirotek. Envirotek has actively supported a recently concluded Ocean Renewable Energy in Islandic Conditions Workshop jointly organized by the International Energy Agency – Ocean Energy Systems (IEA-OES), the Energy Research Institute @ Nanyang Technological University (ERI@N), and OceanPixel Pte Ltd last March 8-9, 2017 where participants from the Southeast Asian Collaboration for Ocean Renewable Energy (SEACORE) network and other global island regions were present.